Yesterday the girls and I had the special privilege of visiting Agape Ranch, the fine folks who brought us Lydia, our Great Pyrenees. This visit was solely to indulge in a little "puppy love." 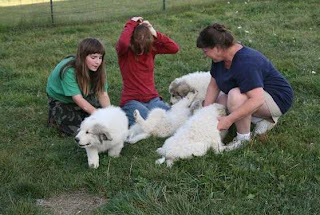 Their latest litter of eight Pyrenees pups were born July 5, and the little ones are about to leave with their new owners. Three have already gone, and the rest will be placed by next week. If we wanted to see the puppies, it was now or never! Oh my goodness, did we have fun! There's nothing like a bunch of tumble-about, plump, furry little bundles of joy to make you smile! The puppies' mom, Ruthie, gets some lovin' from Jim, the breeder. On the left is Elijah, the puppies' father, a magnificent creature if there ever was one. On the right is Sissy Bear, another (fixed) female who joins Elijah and Ruthie in guarding the sheep at Agape Ranch. After all this rough-and-tumble excitement, the puppies suddenly decided they needed a snack. Poor Ruthie was literally anchored by puppies! In fact, here she's balanced on three legs as the puppies greedily guzzle mama's milk. What a patient angel Ruthie is! Why go around when you can go under? Younger Daughter's hair was a disaster after getting chewed by all those rambunctious critters! One of the reasons I admire Jim and Carol of Agape Ranch is their ethics about breeding. They only sell their pups to people they feel will be good stewards of these animals. We feel honored to be included in this group. Thanks for sharing. I could feel the puppy love! Ahhhh... Puppies! Better than a shot of Vitamin B for a blah dreary day. Thank you Patrice!